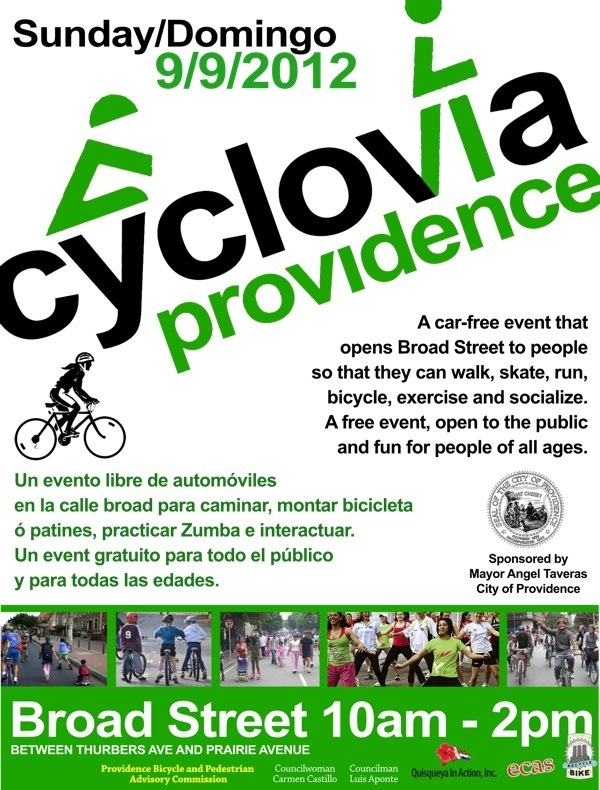 Cyclovía Providence, Sunday, September 9th, 10am – 2pm on Broad Street (Between Thurbers Avenue and Prairie Avenue). A car-free event that opens Broad Street to people so that they can walk, skate, run, bicycle, exercise, and socialize. A free event open to the public and fun for people of all ages. Each Sunday and on holidays from 8am until 2pm certain main streets of Bogotá, Cali, Medellín, and other municipalities are blocked off to cars for the exclusive use of runners, skaters, and bicyclists. At the same time, stages are set up in city parks. Aerobics instructors, yoga teachers and musicians lead people through various performances. Bogotá’s weekly ciclovías are used by approximately 2 million people (30% of citizens) on over 120 km of car-free streets. In Bogotá, permanently designated bikeways are also known as ciclorutas, while streets temporarily closed for that purpose are called ciclovías. Ciclovías is a proposal coined in Colombia but the inspiration is credited to the city of Bogotá. The events have taken place since 1976 when they started through the efforts of organizer Jaime Ortiz and others. Some credit Bogotá Mayor Hernando Duran Dusan with starting Ciclovías in the early 1980s. Mayor Enrique Peñalosa deserves some credit for turning Bogotá into a safer cycling city by taking on the dominance of automobiles in the late 1990s. In 2007, a Colombian congressman, Rep. José Fernando Castro Caycedo, proposed a law restricting the hours of Ciclovías all over the country to between 5 am and 12 noon, charging that it caused traffic jams. Ciclovía users protested the change, and received support from ex-mayor Peñalosa and current mayor Samuel Moreno, as well as several members of the city council and other congressmembers. The proposal was defeated. Update: Press release from the Mayor’s Office, yes, I am quoted in it. PROVIDENCE, RI – On Sunday, September 9, a half-mile stretch of Broad Street will be closed to traffic for Cyclovia Providence, a car-free event that opens the street for people of all ages to walk, skate, run, bicycle, exercise and socialize. The event will occur from 10am to 2pm on Broad Street between Thurbers Avenue and Prairie Avenue in the heart of Providence’s historic Elmwood neighborhood. “Cyclovía Providence will turn Broad Street into a giant paved pedestrian and bike path for people from every corner of our city to come together, exercise, have fun and enjoy a new perspective on all that Providence has to offer,” said Mayor Taveras. Sponsored by Mayor Angel Taveras in collaboration with the Providence Bicycle and Pedestrian Advisory Commission, Cyclovia will include bike rentals and bike repair, dance lessons, yoga and food vendors from Broad Street restaurants. Cyclovía is an international phenomenon that reportedly began in Bogotá, Colombia and has spread to cities across the globe, including New York City, Chicago, Seattle, San Francisco, Los Angeles, Miami, and Cambridge, MA. Project for Public Spaces (PPS), a nonprofit planning organization, has described Cyclovía as a large-scale community building exercise that facilitates social interaction and activity between people of all ages, incomes, occupations, religions and races. “Cyclovía Providence is a great way to get more people walking and biking in our city, and to build awareness and support for investments in bike lanes and public transit,” said Jef Nickerson, a member of the Providence Bicycle and Pedestrian Advisory Commission and the founder of the blog Greater City Providence. Mayor Taveras established the five-member commission this past spring to study changes in laws for bicycles and pedestrians and to help incorporate bicycle and pedestrian planning in the city’s Sustainability Action Plan. Providence’s first-ever Cyclovía event will occur in Elmwood – a family neighborhood and one of Providence’s most ethnically and culturally diverse communities, anchored by a vibrant business district on Broad Street with ethnic restaurants that draw patrons from across the city. Five blocks? Please tell me this is only a joke. I wonder how many people attending are going to drive down there.